I have been established in the UK at Hurstpierpoint in West Sussex, buying and selling antique clocks for nearly 25 years, if you would like more details of any of the antique clocks on these pages please feel free to contact me. All the antique clocks I have for sale have been serviced and where appropriate restored to their original glory, I guarantee all of them to be genuine and in perfect working order. 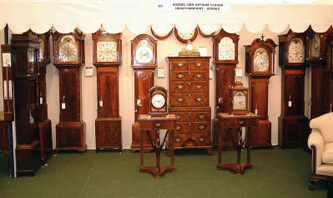 We have many varieties of clocks, such as Longcase Clocks, Bracket Clocks, and Carriage Clocks. I also offer a restoration and repair service. You are welcome to visit my showroom which is open from Tuesday to Saturday 10am - 5:30pm other times by appointment, a map of my location can be found on the About Us page. The Antique Clocks On These Pages Can Be Delivered Throughout The UK And Exported Worldwide.